Transitioning over to civilian life from the Military is difficult but the majority of new veterans have great career options. What they lack is context on the career they're looking at: where to go to school, what hurdles are associated with that occupation, and how to manage expectations? As a leader in your field, you can provide context and advice to veterans who might be looking to do what you are doing. Some sage advice from you could go a long way. You are either a veteran or somebody in the regular or reserve force looking to start your next career path outside of the military. We can help by lining you up with a mentor in the field, vocation or industry you're looking to get into. Our Mentors are veterans of their industries and they can help by giving you insight on the job, the education needed and how to get started. Even if we don't have the right mentor onside, we'll commit to finding the right one for you. We need volunteers. This program needs regional managers, event people, administrators, mentor recruiters and numerous other roles in order to help meet the demand. Our organization is fun, dedicated and striving to create a more successful transition for soldiers to civilians. So even if you can't help mentor a veteran, please give us the gift of your time and talents so we can continue to help Veteran's transition successfully in Canada. It will be time well spent. Dana M was a Sgt in the PPCLI. He served in 2 combat missions in Afghanistan, and was injured on his last deployment. When Dana retired he decided he wanted to pursue a career in the tattoo industry. 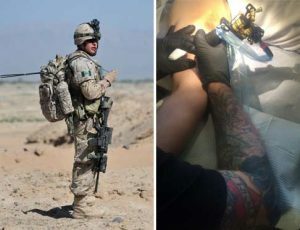 There was no Mentor within the Sol2Lead program for tattooing so a Mentor with an art background took on the challenge. Dana didn’t have much experience in art and didn’t have any in-roads with the tattoo industry in Vancouver. Over a dozen tattoo shops were contacted by the Mentor with the hope of getting one of their owners to sit down with Dana over coffee. The tattoo business is very competitive and they receive requests for apprenticeship daily. All but two of the 12 parlors didn’t respond but one that did agreed to having a quick chat with Dana. Dana’s personality and story won over the owner and he agreed to let Dana come by his shop to ‘clean up’ and hang out. After 6 months Dana became a Tattoo Artist’s Apprentice and is well on his way to becoming a licensed artist.